I'm dusting Mindy Kaling, again, and thinking, again, about all the stupid things I do for my husband and figured it's probably worth a blogpost. 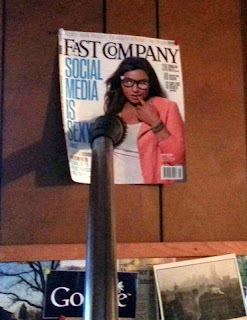 First, I'm not sure how I feel about my husband tacking a magazine picture of a beautiful actress (Mindy Kaling) on the wall above his desk, but while I'm thinking about how I feel, I have to keep it dust-free. Y'know, to match the rest of the house office. While I'm dusting, I'm thinking about all the junk we collect and keep. Forever. And the motive behind each object, which, really is for my therapist, not my blog. Over a year ago, we began building a 600 square foot apartment in which to live for awhile. My motive to downsize was to be forced to get rid of all this junk. (see above photo) Due to hoarding unplanned issues, we put the apartment on hold for a bit and we continue to live surrounded by 4,000 square foot of junk. "Keep what is working, change what is frustrating." ..... maybe if I keep dusting Mindy Kaling, just maybe my husband would start dusting my beautiful knob collection for me? 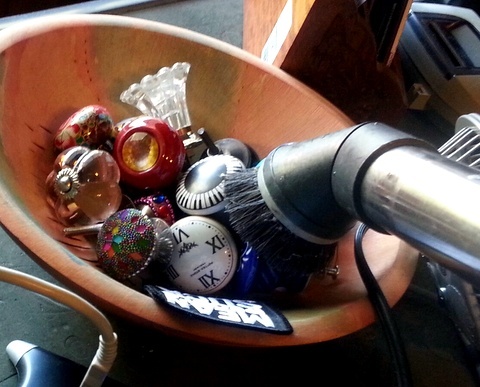 I never knew you had a knob collection....interesting stuff!